All the clogs are produced on wooden English sized lasts (ladies 3-8). 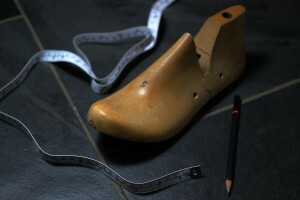 Clog lasts are on the generous side but as a general rule, if you normally wear a size 5 order a clog size 5. As all clogs are made to order and we want them to be perfect for you, we think it’s advisable to take a few minutes to measure your feet and then compare them to the size table which has the English size, length of the last the clogs are made on and the length of foot giving a minimum and maximum measurement for each size. This shows the gap between the longest toe and the end of the clog which we suggest should be between 13-20mm. When comparing your foot length, wide feet should be nearer the minimum foot length toe gap (20mm) and narrow feet can be nearer the maximum foot length toe gap (13mm). For example if your longest foot measures 240mm go for a size 5. But if its 234mm and you have a very narrow foot (and wear a thin sock) drop down to a size 4, whereas if you have a wide foot of 234mm length – order size 5. Tape a piece of paper to the floor next to a wall. Place your barefoot on the paper at 90 degrees to the wall with the heel tight against the wall. Putting your weight on the foot, mark where the longest toe is on the paper. You’ll now have 2 marks on the paper, take the longest one and measure it in millimetres (mm) – this is your foot length which you can use to determine your clog size on the table below. Measuring with bare feet gives a sizing for wearing the clogs with thin socks, thick socks would obviously need more room so do the measurements again wearing your preferred socks to check you will have enough room. Everybody’s feet are different and we have tried to be as detailed as possible about the sizing of the clogs to ensure you are pleased with the fit as well as the design. But if you are still not sure please don’t hesitate to email or phone for further help.